You may be surprised to learn that if you walked into a shoe factory today versus forty years ago, a lot of what you’d see would be the same. At the heart of footwear manufacturing, one key thing has been slowing down production for decades—shoe molds. Molds are expensive, labor-intensive, and time-consuming, yet they’re critical throughout production. Molds for midsoles, molds for outsoles, molds for shoe cushioning. You get the point. Because of these molds, many athletic footwear companies still need around 18 months to go from initial designs to get a product in stores. Even if companies come up with a new killer idea, they’re stuck with a slow timeline. So, when Bill McInnis, a former NASA rocket scientist, was put in charge of Reebok’s innovation house, Reebok Future, and tasked with exploring new products three to five years out, he knew one thing had to go—the molds. 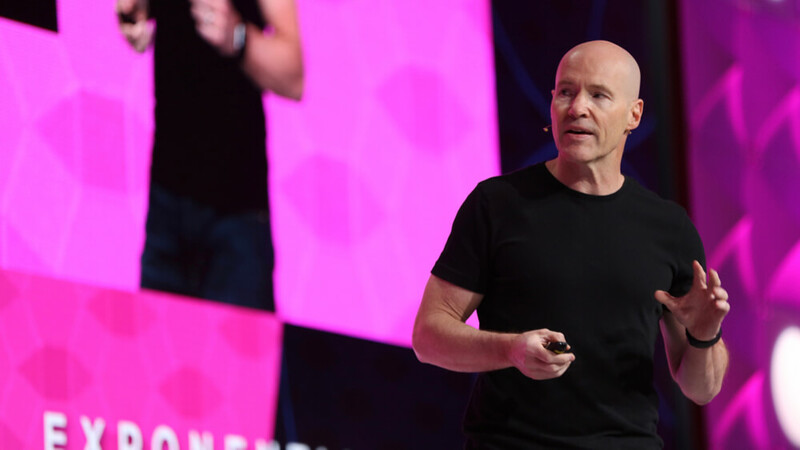 At Singularity University’s Exponential Manufacturing Summit last week, McInnis gave the audience a glimpse into how Reebok Future is shaking things up in shoe manufacturing. Bill McInnis at Exponential Manufacturing. McInnis said his team began searching for ways to transform shoe manufacturing by focusing in on the production process. The goal was to find a new method that would eliminate shoe molds, increase speed, localize production, and ultimately create something with appeal to a lot more customers. The result was the creation of the Liquid Factory, one of the first major breakthroughs out of Reebok Future. Liquid Factory is solely focused on changing process—how you make things, where you make things, and what you make things with—in order to fundamentally change what the end product becomes,” says McInnis. How is Liquid Factory beginning to bypass molds in the shoe-making process? 3D printing is an obvious guess, but existing options weren’t quite right for their needs. McInnis explains that with available 3D printing technology the process would still be too expensive, slow and that the materials weren’t spot-on for athletic footwear. Taking inspiration from industrial robots in the automotive industry, the team started considering how to make industrial robots act like a very simple 3D printer and in doing so work a lot faster. To achieve this, the team bought an industrial dispensing machine. They also found a material perfect for the job—liquid polyurethane (hence, the name of the lab). The machines in the Liquid Factory draw in three dimensions, successively laying down layers of liquid polyurethane. “The great thing about polyurethane is it’s got a myriad of uses, from very firm and responsive skateboard wheels to very soft and plush memory foam, and anything in between. You can dial that on a case-by-case basis. That’s exactly what we want under somebody’s foot. Soft, firm, all the same material,” says McInnis. Most notably, it led the team to create Liquid Speed, a shoe featuring the first ever “energy return outsole.” The outsole boasts two times the energy return of a standard one. Now, the team is working on a new shoe concept called Cotton + Corn, which is completely outside of 3D printing. Like the name suggests, the shoes are made completely from materials derived from corn and cotton. The final shoe may be decomposable, and the team is hoping to have the product on the market later this year. New technologies like 3D printing are finding practical applications beyond prototyping – especially in shoes – and as they do, the results remind us of their transformative power, and that there’s certainly more to come.